The nuclear-capable Nirbhay missile had to be destroyed midair. A test involving the long-range cruise missile Nirbhay had to be aborted and the missile destroyed midair, according to a statement issued by India’s Defence Research & Development Organization (DRDO) last Friday. “Long range cruise missile Nirbhay was successfully launched today at 1150 hrs from launch complex, Chandipur, Odisha, meeting the basic mission objectives successfully. After travelling approximately mid-way, deviations were observed from its intended course. Further, flight was terminated to ensure coastal safety,” the press release states. 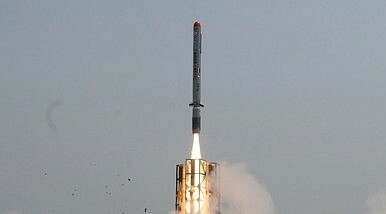 The Nirbhay had previously been tested in March 2013 and in October 2014, with only the latter test declared a “partial success.” The second failure of the test of the Nirbhay long-range subsonic cruise missile–India’s answer to the United States’ Tomahawk and Pakistan’s Babur missile—will, in all likelihood, once more push back operational clearance of New Delhi’s latest weapon. The land-attack cruise missile has been under development for a decade now and is designed to be launched from air, land or sea. It boasts a top speed of 0.6-0.7 Mach, is configured to fly at low altitudes to avoid enemy radar detection, and also has “loitering capabilities” to identify battlefield targets. The third failed test is particularly bad news for India’s burgeoning ballistic missile submarine fleet. As I reported last week (See: “India’s Deadliest Sub to Test-Fire Missiles”), the INS Arihant, the Indian Navy’s first indigenously developed ballistic missile nuclear submarine (SSBN), was scheduled to test-fire the Nirbhay this month, but it is unclear whether the test will proceed now. This leaves India’s ballistic missile submarine fleet with a less than ideal weapon, since the other weapon slated to enter service with the Indian Navy’s SSBN boats, the K-15 Sagarika submarine-launched ballistic missile, has a more limited range (around 700 kilometers) which would mean that any vessel would have to move closer to enemy shores to launch the K-15, making it vulnerable to detection. The Nirbhay’s longer range of over a 1,000 kilometers makes it consequently a more suitable weapon for the INS Arihant. After the successful completion of the Nirbhay missile test, the submarine was slated to enter service with the Indian Navy during the International Fleet Review held in the port city of Visakhapatnam in February 2016. The INS Arihant is the lead vessel of the Indian Navy’s future fleet of four to five Arihant-class SSBNs.